A John McClane ‘Origins’ / ‘Year One’ book, exploring his life as a cop prior to the Nakatomi Plaza hostage crisis. Sounds like a great idea, and actually lives up to its promise. A greasy, corrupt New York is laid bare, with McClane as the rookie cop, fresh from the Marines, dealing with flashers and amorous older women, all the time biting his tongue until he has ‘grooves worn in’ as he regularly gets his balls busted by his training officer, Ken Bingham. Elsewhere Rosie Haskell, a pretty Blonde girl from a small town, is really having a day to forget, as a ‘New York minute’ places her in the wrong place at the wrong time, on the Island of Manhattan. She sees 2 cops – Peter Noonan and Russ Ciardello – in a comprimising situation with a body in an alley. That is not the problem – the problem is when they see her, watching them…. McClane and Haskell are going to cross paths soon – but that is not for this issue. The scene is being set up for that encounter, as killer corrupt cops are ready to pounce on Haskell as soon as she breaks cover. Written by Howard Chaykin, the series is really capturing the spirit of the McClane character, with his quick wit and regular-guy attitude. The art by Stephen Thompson effortlessly captures the flavours of day to day New York hustle and bustle, and also manages to convince with a good portrayal of a younger McClane. The language is authentic, the scenario gripping and the issues skips along with little drag. A good ten to fifteen minutes of your time well spent – and what more justification do you need for investing in a comic book? 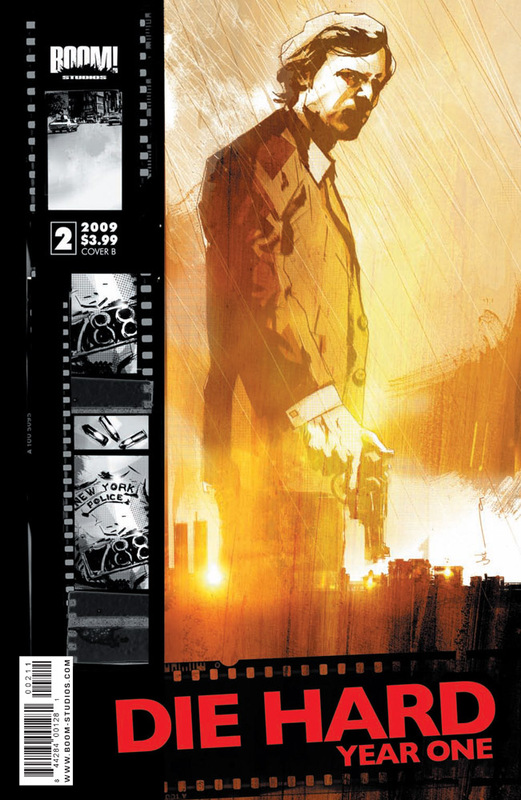 Finally, a quick nod to UK artist Jock (2000AD / Vertigo’s ‘The Losers’) who does the ‘b’ cover – and what a treat it is – McClane remodelled as a shaggy haired Dirty Harry with a New York sunset in the background. Love it! 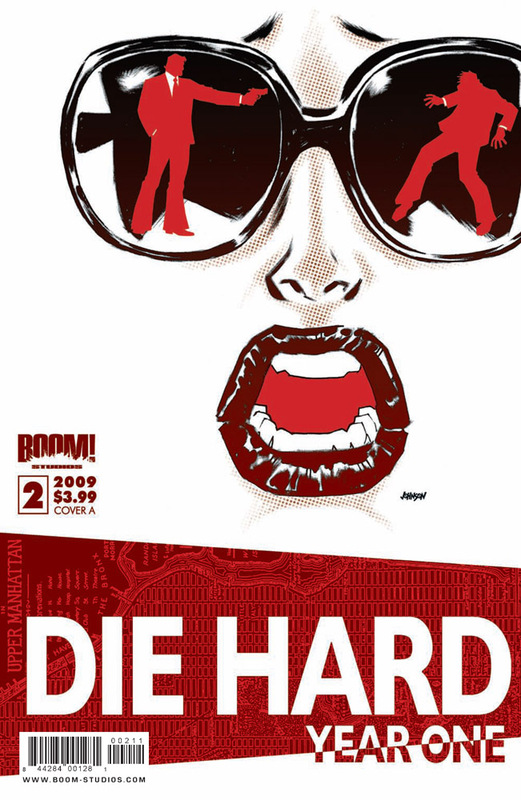 ‘Die Hard Year One’ #2 is out tomorrow (28th October) from Boom! Boom! Studios kindly provided a digital copy of this issue for review.